HP iPAQ 200 Series belt case give your iPAQ 200 Series Pocket PC that professional look with this high quality premium black leather exterior case with magnetic closure. 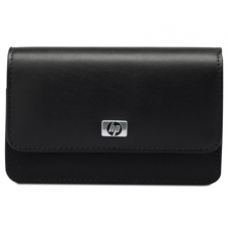 The construction leather is ultra soft and designed to hold your HP iPAQ 214 in supple luxury. This is a front flip type case and is a great investment for protecting your iPAQ 214 handheld. * Premium Black Leather Exterior. * Leather With Magnetic Closure. * Horizontal Belt Clip For Improved Mobility. * HP Product Part Number: FB014AA#AC3.